First Read's Morning Clips: Cuomo: America "was never that great"
Some Trump loyalists think he would benefit from Democrats taking the House, writes POLITICO. And Steve Bannon is launching his own effort to try to boost the GOP's fortunes. AZ-SEN: Republicans worry that Trump is making things worse by praising all three candidates in the Arizona Senate race, but endorsing none. Martha McSally and Kyrsten Sinema both say they won't participate in primary debates. CO-GOV: Jared Polis is planning a $3 million spending blitz. FL-GOV: The Tampa Bay Times looks at whether Bernie Sanders could move the needle in the governors' race. KY-6: The New York Times looks at the Barr v. McGrath battle playing out in KY-6. MI-GOV: Joe Biden endorsed Gretchen Whitmer. MS-SEN: A Democratic poll shows that Mike Espy could have a path to victory. 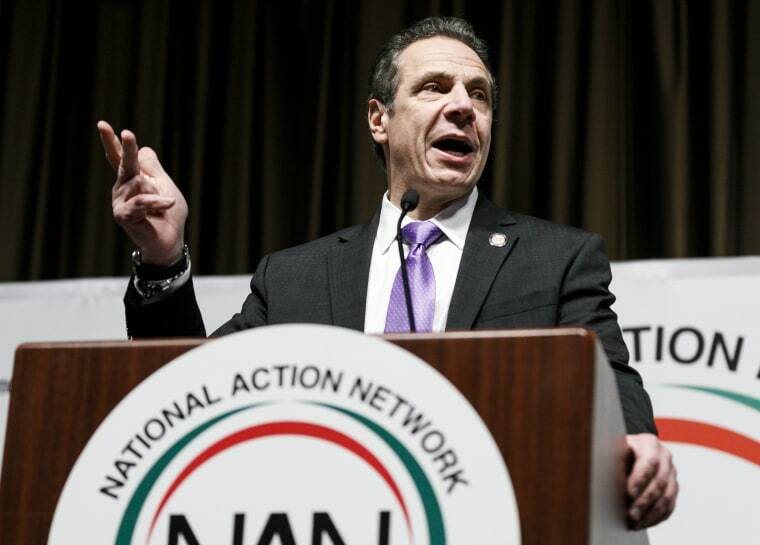 NY-GOV: Andrew Cuomo is taking heat for saying "We not going to Make America Great Again. It was never that great." TX-SEN: McClatchy: "Cruz says he ate a big 2012 campaign loan, but he’s still listing it as a top asset"
WI-1: CLF is hitting Randy Bryce on his legal troubles. WI-GOV: The general election is well underway just a few days after the primary. WY-GOV: Could Foster Friess win the gubernatorial nod? Here's the latest on Trump's move to revoke John Brennan's security clearance. And here's how Brennan responded in a New York Times op-ed: "Mr. Trump’s claims of no collusion are, in a word, hogwash." Trump's lawyers say they're prepared to fight a subpoena all the way to the Supreme Court. Don't miss the Washington Post's look inside the marriage of Kellyanne and George Conway. Ryan Zinke is blaming "environmental terrorist groups" — not climate change — for the severity of this year's wildfires. Masterpiece Cakeshop is back in the news. A bipartisan Senate study found that the federal government is doing little to protect migrant children who are separated from their families. Here's what Twitter CEO Jack Dorsey told NBC's Lester Holt about the service's brief suspension of Alex Jones.